Winnipeg police will be invited to march in the city's Pride parade next weekend, but not in full uniform, according to a joint statement by a handful of groups representing the LGBT community. Winnipeg police will be invited to march in the city's Pride parade next weekend, but not in uniform, according to a joint statement by a handful of groups representing the LGBT community. Pride Winnipeg made the announcement in a joint news release Friday with Queer People of Colour Winnipeg, Two-Spirited People of Manitoba, QueerView Winnipeg and the Like That program at Winnipeg's Sunshine House. The decision follows almost a year of consultation with community members and groups about police participation in the event. "Our ultimate goal is to have a positive and healthy relationship between the police and the LGBTTQ community, and it was clear based on the survey that the community's not there yet and the Winnipeg Police Service is not there yet," said Darrel Nadeau, vice-president of governance for Pride Winnipeg. The organization conducted an online survey of community members that got 600 responses, he said. A third of them described negative encounters with police, citing experiences of mistrust, apathy and prejudice that were especially prevalent among transgender people, two-spirited people and queer people of colour. Many survey respondents said the uniform itself was a "trigger point," Nadeau said, associated with traumatic or negative experiences with police, so officers are asked not to wear them, and police cruisers won't be in the parade. It's been a flashpoint issue in several cities. 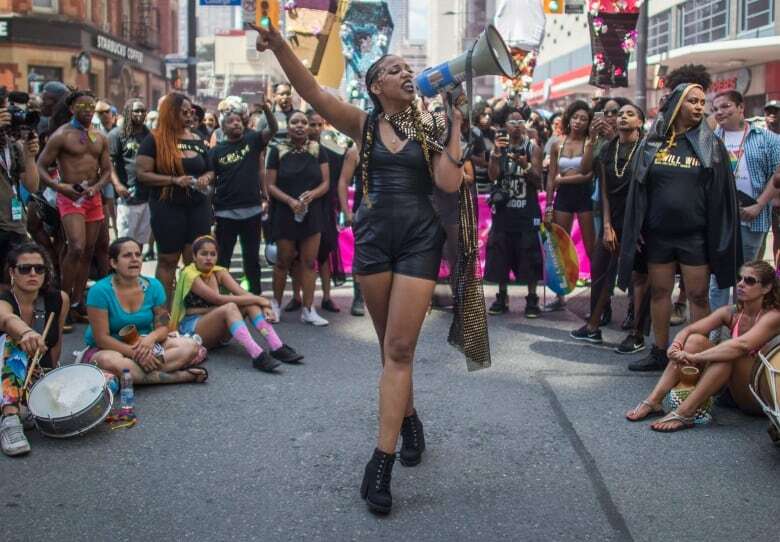 Last year, Black Lives Matter Toronto brought that city's parade to a standstill until Pride's leadership agreed to a list of demands, including that police officers not be able to march in the parade in uniform and the force not have floats or vehicles in the parade. In Toronto and Vancouver this year, officers won't wear uniforms. Nadeau said Pride Winnipeg and the other local stakeholders weren't interested in totally excluding police. "Exclusion, we feel, would not have allowed us to achieve positive change and to build towards positive change," he said. "And Pride by it's very nature is an inclusive organization." WPS members who want to represent the institution are welcome to do so in other ways, like carrying banners or with WPS-branded clothing, according to the news release. Officers who are on-duty, providing traffic control or security, will still wear uniforms. Nadeau said survey respondents' opinions on police participation in the parade ranged from fully supportive to completely against, and he said not everybody in the community will be happy with Pride's decision to find a middle ground. Insp. Gord Friesen, commander of the community support division, said police have been working with Pride since the controversy began. "I say we're not being excluded; we're being included with conditions that are reasonable and understandable," he said. Friesen did say some LGBT officers and allies are disappointed, because they're proud of their organization and their uniform. He also said police carry weapons for a reason — so they're equipped to deal with whatever happens. He likened the move forward to the work the division does with newcomers. "They come from places where the police don't conduct themselves the way we do," he said. "When they come to your house, that's not a good day, they're not there to support and help you." "When we meet with these folks and we know that the sight of a uniform or weapon maybe at trigger for them in terms of anxiety and stress, we won't wear our uniforms and we won't have our weapons in plain view," he said. "Because we want to humanize the police force first. And then once there's some trust there, then we'll introduce the uniform." Pride Winnipeg and the other groups that signed onto the joint statement identified three changes Winnipeg police could make to improve the service's relationship with LGBT people, including increased awareness and training, more active consultation with the community and greater year-round engagement, especially with groups that are traditionally excluded, like queer and trans people of colour, trans and two-spirited people, non-binary people and queer youth. The objective is to improve the culture within the Winnipeg Police Service towards LGBT individuals and foster long-term relationships and dialogue. Nadeau said the rule isn't written in stone: in years to come, Pride will re-assess the relationship and change the policy if it improves. The Pride Winnipeg Festival runs from May 26-June 4. 2. Greater, year-round engagement between the WPS and the LGBTTQ* community, especially with groups that are traditionally socially excluded. This includes engaging leaders and groups within the Queer and Trans People of Colour, Indigenous and Two-Sprit, Transgender, Non-Binary, and Queer Youth populations to work toward relationship building so that community members can connect directly where possible with WPS. Objective: building positive, long-term relationships with groups that have indicated having the highest rates of negative lived experience with the WPS. 3. Taking a more active role in consulting and listening to the views, concerns and suggestions of the LGBTTQ* community on an ongoing basis and taking appropriate action in response. Objective: ongoing, year-round dialogue between the LGBTTQ* community and the WPS in order to uncover further issues, identify concrete actions to address them and update on progress in improving the relationship.